A conversation with WERK for Peace organizer Firas Nasr on using all forms of dance to claim space, promote healing and advocate for peace. After learning that 49 people had been massacred, and 53 others wounded, in a mass shooting at a gay nightclub in Orlando, Florida, Firas Nasr decided to take a stand. 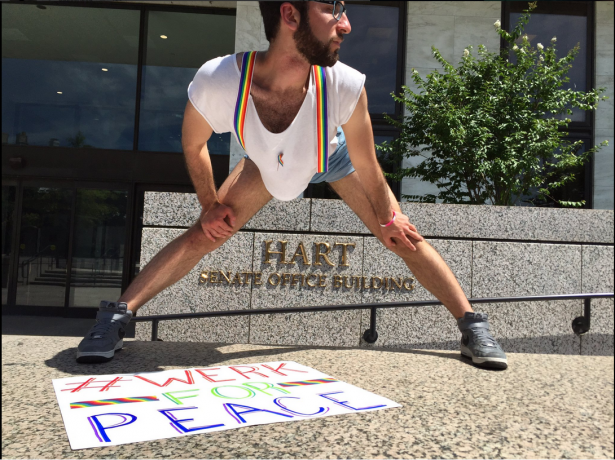 As a queer activist, dancer and human rights advocate based in Washington, D.C., Nasr began organizing a group of friends and fellow dancers to start WERK for Peace — a movement using all forms of dance to claim space, promote healing and advocate for peace. WERK for Peace is taking on its first campaign to pressure Congress for gun reform by staging “dance n’ die-ins” on Capitol Hill, performing at anti-hate rallies and protesting with other groups against gun violence outside the National Rifle Association. Nasr studied human rights at Middlebury College and has been dancing for years. He is becoming the face of a small, but fierce movement to elevate queer and LGBTQ voices in the ongoing intersectional struggle for peace and justice around the world. What made you decide to start dancing — or “werking” — for peace? So, that’s what WERK for Peace is. We use dance to promote peace in response to the Orlando tragedy. Our current campaign is gun violence prevention. We take to the streets, take to the dance floors, to clubs and bars, to the stages, to the nation’s capital, to congressional buildings, and we assert that we are here, that we will dance. Why use dance to address the issue of gun violence against LGBTQ communities? There are two sides to answering this question. On the one hand, dance is an integral part of the queer movement. From the Stonewall Inn, which is now a dance club, to Pulse Nightclub, dance has always provided an outlet for the queer community, whether in secret or not. Dance floors, clubs and bars have also always been a safe space for the queer community. Dance is an integral part of our movement. On the other hand, dance is healing. Using your body, using movement as a way of healing is very powerful. So dance, in that sense, is a form of healing and allows us to use our bodies to process the events, or to process violence against our bodies and against our brothers and sisters (or non-gender-conforming siblings’) bodies. And this is where WERK for Peace adds to the dialogue — to use dance as a form of protest and as a form of assertion, of claiming space, and to love ourselves through dance at the same time. What are some of the main actions you’ve organized so far with WERK for Peace, and what response have you received? We organized two actions on Capitol Hill that bookended Congress going out of session and coming back into session. We did a flash mob in front of the U.S. Capitol right before Congress went out of session to demand congressional action for gun reform and gun violence prevention. 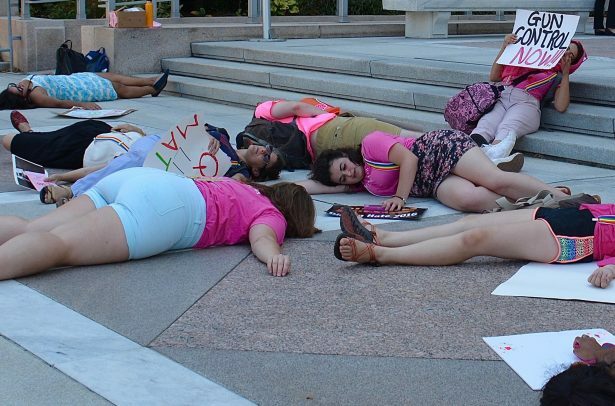 Congress did nothing, went out of session, and then on the day Congress came back into session, we did what we called a dance n’ die-in, in collaboration with Gays Against Guns D.C. and Code Pink. We went around to various congressional buildings and danced in front of them, during which we would announce, “Welcome back Congress, did you know that since you went on recess 4,500 people died from gun violence?” Then everyone started chanting, “How many more have to die?” And that message is powerful: “Congress, have you forgotten about us? 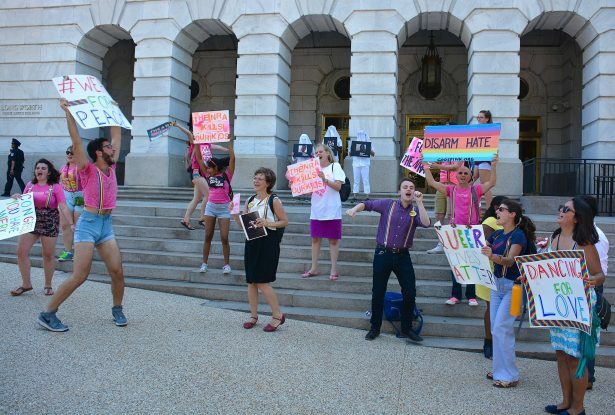 Because we haven’t forgotten about gun violence” and “We are queer, we are here, and we will dance.” Those two actions kind of bookended Congress’s recess to make a statement to say that we’re not forgetting that you haven’t done anything to protect us. Other actions that we’ve taken include dancing at the 9:30 Club [in Washington, D.C.] to raise funds for the One Orlando Fund and dancing at the Disarm Hate rally, which we closed out with a flash mob to get everyone dancing and to end on a positive body-moving note, using our bodies to promote peace and to demand change and action. The next day we did a dance out in front of the NRA, and we collaborated with a whole bunch of Virginia organizations — there were over a hundred people there werkin’ it for peace. Then we performed later that week at the Anti-Violence Initiative, where we closed out the entire event. The event was called Taking the Stage, Taking a Stand: LGBTQ Voices Against Violence. It was a beautiful moment where the DJ facilitated, in a sense, an open mic that turned into a discussion about violence in our community. There were performers who did spoken word, who did singing, and we did a dance to get people up and moving to use their bodies to heal, to promote peace, and to express and love themselves. How have you handled situations where law enforcement has asked you to move your demonstrations, like the die-in you staged on Independence Avenue? Are there circumstances in which you would employ tactics of civil disobedience and not comply when they ask you to move? We contemplated this a lot. In this instance, we actually forewarned the police to let them know we would be doing these die-ins, because technically die-ins are illegal. You’re not allowed to lie down on the ground on Capitol Hill, except on grassy areas, no longer than 30 minutes. So we told the police we would be doing them, and when we did them we made it so the die-ins weren’t excessively long. The die-ins were about a minute long in each space, so that allowed us to send our message, but to also stay within the boundaries of the law. That said, we were contemplating doing civil disobedience, and I think that civil disobedience will be part of future events. What have been some of the most challenging and rewarding aspects of actions done by WERK for Peace so far? Is it what you expected when you set out? It’s been a beautiful learning process. I always jump back to the event at the Anti-Violence Project, where I felt how rewarding it is to be part of a space where everyone could feel safe participating in movement and dance for peace, or could participate in “werking” for peace. Also, it’s always rewarding when you finish a gig or finish a dance and you can just take a step back and reflect on it, to really feel your body moving and know that there’s power behind that. It almost makes me feel justified in being, and that is a really powerful experience. As for the challenges, you go to a lot of events and you hear a lot of stories, and I have definitely needed a lot of time to process everything that’s happening. In a sense, your body becomes public. It’s funny because I came out on Facebook by changing my profile picture to a photo that WERK for Peace used as one of the main photos of our movement. So for me it was not only a process of claiming space and asserting that I am here, it was also a process of reconciling who I am and how I feel. What role has the upcoming election played in how you’ve organized and who your message has targeted this year? Many gun violence groups are really pushing for finding the officials who are working for gun violence prevention and putting them into office. That’s great, and WERK for Peace does support that. But, as I mentioned before, we live in an oligarchy. We don’t live in a democratic society, unfortunately. WERK for Peace, as an organization, favors a more intersectional approach. We recognize that this faith in the system, just electing people who are for gun violence prevention, does not address the issue of police brutality and Black Lives Matter; it doesn’t address the issue of native lives that are being, in many ways, disregarded as we’re seeing in North Dakota currently with the pipeline. It also doesn’t take into account the obsession our country has with war and military spending. With the elections, we’re happy that the Democratic Party seems to really favor gun violence prevention laws and we appreciated the sit in that [House Democrats] did. I thought it was really great, but I also felt that the fact that it was based on the No Fly No Buy and Terrorist Watch List makes it racist, as both of those lists disproportionately affect Muslim individuals. People don’t have to be notified to be put on the list. So it does not make sense for us. That bill would have been some action, but was it the action we were looking for? No. Did any Congress members join you at your actions? When we did our action on Capitol Hill, we invited a number of senators who are pro-gun reform to come and join us, but no one came out. We invited them to come and say something, to continue that conversation. If you really claim to live in a democracy, then you need to represent your people. Over 80 percent of people in the United States favor some form of gun reform. Where is the reform? Where do you hope to go from here with WERK for Peace? We’re looking to start chapters in other cities — New York definitely being one of them, but we’re open to other cities as well. We’re hoping to start a video campaign where we encourage individuals to talk about their vision for peace and then use dance — kind of like the ice bucket challenge — to start a series on social media of people affirming and intending a vision for peace and then dancing it out. So that’s one thing that’s definitely on the horizon. We’re working on putting together a tour for peace. I’m hoping it will be both national and international. And our big symbol is rainbow suspenders. I am happy to support activists around the country or around the world who are interested [in joining us] by sending them rainbow suspenders, or [people can] just buy a pair of rainbow suspenders for $10 off Amazon, put them on and get out there and werk for peace in your own way. We’re looking for more dancers. It’s all forms of dance to promote peace. If you’re interested in promoting peace in an intersectional manner, then you’ve found the right group. Given that the “activists” who support non traditional lifestyles demand that their voices be heard and acknowledged publicly, I am curious as to why those very same people feel they have the right to stop people who oppose non traditional lifestyles from having their voices given equal time to be heard and acknowledged publicly. And lets be clear hear, the alternative lifestyle community and it’s supporters as well as most of the media and establishment use ad hominem attacks and arbitrary labels among other tactics to ensure opposing voices are not allowed to be heard. In addition, public and private universities which receive public money and tax breaks use the power of their institutions to also crush opposition to non traditional lifestyles. Gays are carving a path toward a one way ticket to fascism and eventually totalitarianism? First of all, don’t mix metaphors! Second, you are clearly homophobic and in the closet with yourself. Come on out! Everybody knows anyway, and your parents are wondering why you won’t finally admit to them that you are gay. Your response, though lacking in terms of legitimate rebuttal does a splendid job of supporting my point. Homophobic? Sorry try again. The truth is I specifically stated, and I am quoting from my previous comment above “They are merely pawns in a far larger and far graver threat to the Republic. (the lifestyle itself is not a threat, but the methods being employed in its name are. )” Still as a Grand Father, I am used to children resorting to sophomoric name calling when they have nothing constructive to offer. As to your claiming that I was mixing metaphors with: “Gays are carving a path toward a one way ticket to fascism and eventually totalitarianism” is a flat out lie given I said no such thing. In the context of what I actually did say, there was no succession of incongruous or ludicrous comparisons. On the contrary, I offered a reasoned, logical and in my opinion, accurate description of the consequences. From the perspective of my generation, state and corporate fascism is alive and well all over America today. And with the evisceration of the Constitution, Bill of Rights and States Rights and the corresponding centralization of power, totalitarianism is staring us right in the face. I made it quite clear that the issue I was raising, and the concerns I have don’t have a damn thing to do with being “gay” or straight or any other orientation. Despite you rather crude efforts to derail my comments with personal attacks my point is quite valid. Many of the people behind a whole host of social engineering efforts ongoing in the US today have obvious ulterior motives far removed from the individual issues themselves. Son you as you get older you will learn to spend more time looking at the bigger picture.